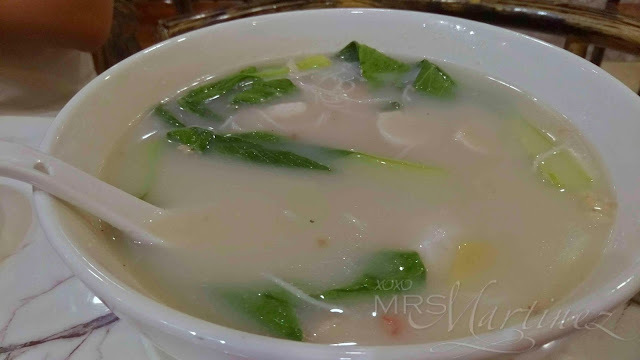 A few weeks ago, DH stumbled upon Ahma's Kitchen- a newly-opened restaurant in Quezon City. If it isn't for the red, black and white signboard, I would have mistaken it for an old house. Well, it looks like it except that it is really a restaurant serving home-cooked dishes straight from Ahma's Kitchen. We were there for dinner hence I had to grab a photo of the restaurant's facade from its facebook page. It was one of those random Fridays when my daughter suddenly picked up the phone and dialed her dad's number. She was asking for a date night, her dad obliged. Since the date was impromptu, she was not able to take a nap that afternoon. Traveling from his office to our house normally takes about an hour. You can only imagine the heavy traffic he had to endure because it was Friday night. By 6pm, I was telling myself that it was a bad idea to dine out. And I was right because by the time we arrived at the restaurant, she was already cranky... boo hoo! 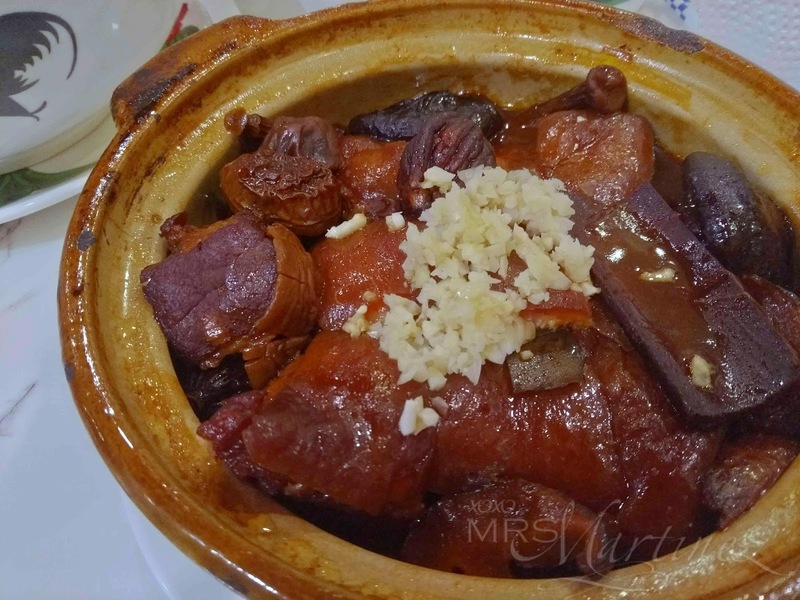 Humba (Hong Ma) is a Hangzhou dish which is made by pan-frying and then red cooking pork belly. The pork is cut thick, about 2 inches square, and should consist equally of fat and lean meat. The skin is left on. DH ordered a lot of food as usual. One of the first dishes that came out was Hongma. It was cooked in a clay pot. Using this type of cooking method makes the food tastes better. The steam inside creates a tender and flavorful dish. The freshly chopped garlic on top was a nice touch. For appetizer, we had kikiam. My daughter ate this dish along with Ahma's Misua. 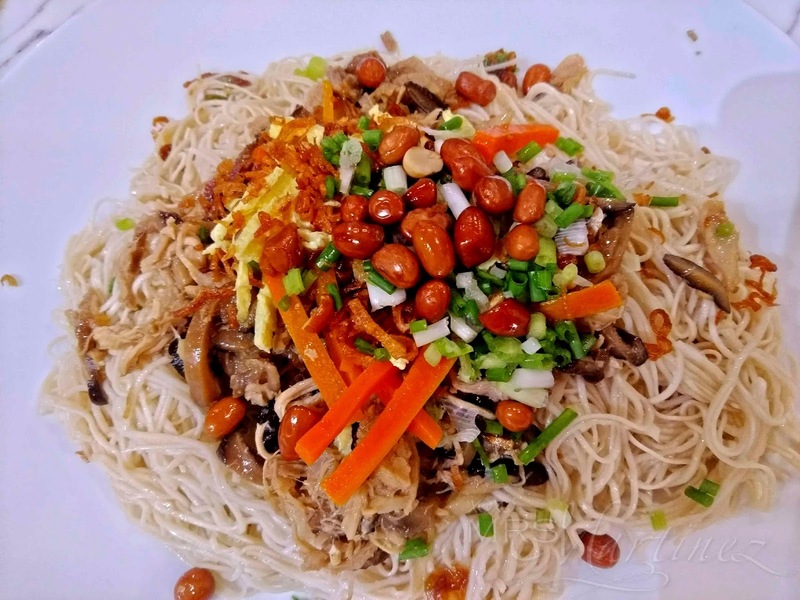 The peanuts on top of the noodles were an added treat to an already appetizing dish. 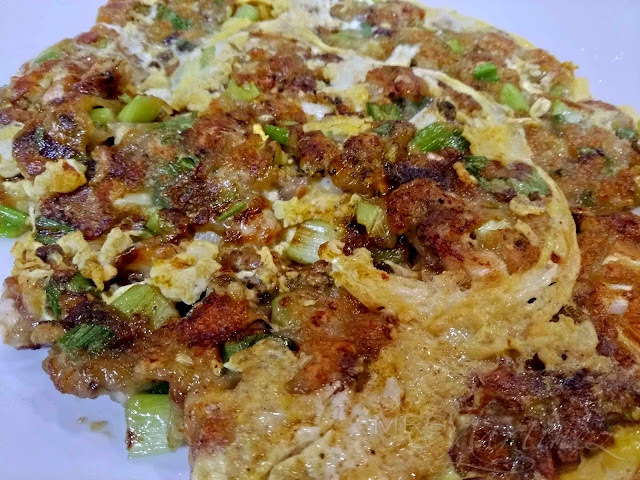 Oyster Omelette Cake ( 蚵仔煎 aka O-a-chien) is made of oysters, bean sprouts and green onions. 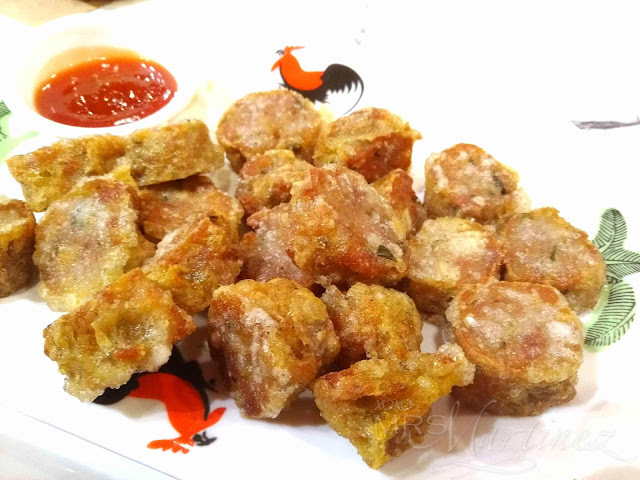 It is mixed with tapioca starch and then fried with eggs. I don't know how to cook an Oyster cake so DH orders this whenever it is available. It looks greasy because it is fried like an omelette. DH said it tasted okay... di malansa! Our meal is never complete without ordering a huge bowl of soup. DH chose Bihon Soup from the menu. I like combining the soup with rice so that my daughter can easily swallow her food. Since the soup came with vegetables and noodles, I also mix it in the bowl. We had a lot of food to take home that night. It's a good thing because DH had a variety of food to take with him to his office that week ; p We will definitely be back for sure. 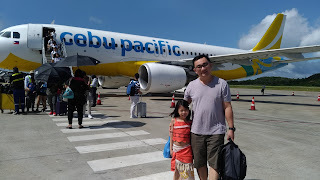 I hope my daughter will be in a good mood on our next visit.